I'll start like I start almost all of the reviews; with a disclaimer, that this rucksack was sent to me by idealo to review. Christoph from idealo contacted me. I was asked what I would like to review, I was asked to pick something through their site. This was a bit different as idealo is a price comparison site. I was like a kid in a sweet shop. I ended up sending a list to Christoph saying I would be happy to review any of those items. 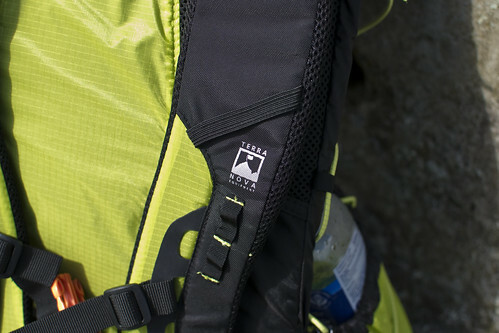 They were nice enough to send it to me the Terra Nova Laser 35 litre rucksack. I have no vested interest in idealo, Terra Nova or the rucksack itself other than to share my views and opinions; good, bad or otherwise. Not long after sending the list in the postman delivered a large but light parcel which got ripped open almost immediately to reveal the rucksack. This was a bit different for me as the last few items have been clothing so on I my first look I usually don them and wear them about the house. Trying to get an idea of how comfortable they are. Not really practical with the rucksack, doesn't really work rolling about the floor with my young daughter playing games or sitting on the couch consuming content on the iPad or watching telly. No Tookie indoors gear test. I would just have to make do with a really good once over in my hands before taking it out to play. On first inspection it's a well manufactured pack. Nice and tidy. The website has it at two different weights, 476 grams and 467 including the 8mm foam back pad. I'm pretty sure it's a typo. My scales had it come in at 478 grams with the back pad in, the website has that at 50 grams but the one I have is very tight fit in the sleeve. It was not shaped, more or less a square cut and is a few grams heavier at 54. Nothing really; it is still a very light pack for it's size, 424 grams without the foam insert. It is certainly the lightest pack that I have handled. 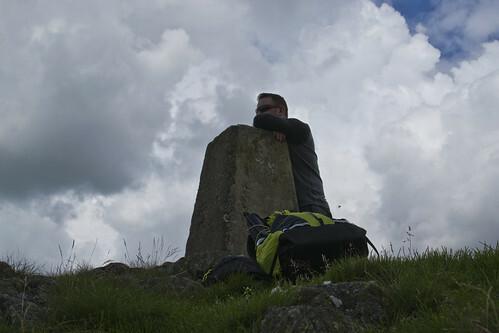 It is also, as far as I'm aware the largest rucksack that Terra Nova have in their range at 35 litres. 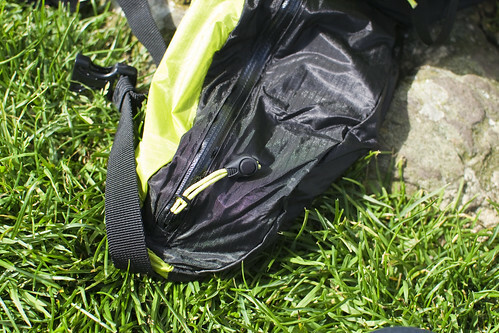 It is made from what feels like siliconised ripstop nylon in a rather bright; if not fetching, luminous yellow and a heavier black fabric in the key rub areas like the seat and the harness. There was no specifics named on any of the tags other than to say "Robust fabric in key areas to give maximum strength for minimum weight". Not much to go on, not even anything in a quick google search with the iPhone. The back panel is made up of some padded mesh at the shoulders and the base of the spine and a plain middle section to give some ventilation and save some weight I assume. On the waist belt it has a couple of pockets. Useful for small items which I'm a big fan of, storing sweets, nuts and other things that you want to have at hand instead of overloading your trouser pockets. They aren't the biggest pockets and you would be struggling to get a point and shoot camera or even some of the latest smart phones in them. However a pocket knife or a compass would be fine. Both are accessed through a water resistant zip. 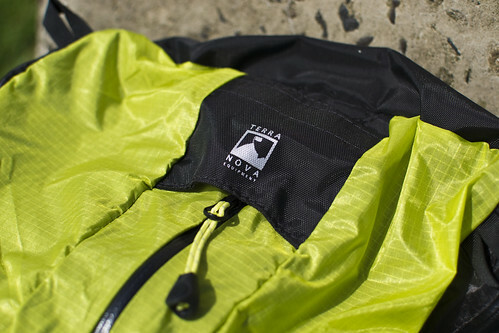 Talking about zips, the main body is accessed through a full length water resistant one. I'll be really honest and say I was sceptical about this. I thought it was a bit of a gimmick. You are so used to snap-to-buckles, drawstrings, lids, flaps and accessing your gear from the top down that anything else just seems wrong. After using it though it's a bit of a revelation, easy access to all your gear. It's all laid out in front of you. No lucky dip rummaging around, poking this one, squeezing that one trying to find the correct stuff sack. My only worry was about overloading the rucksack pulling the zip apart especially with the side compression pulled tight. I tried reconfiguring the bungee cord using the gear loops; while it helped ease my worries, taking away the pressure on the zip. All it really did was hamper my access to the contents by getting in the way as it criss-crossed over the zip. I ended up removing the cord and threading it back into it's original configuration as it was just too annoying and so far so good, no pulling apart. Inside the one and only main compartment there is an elasticated sleeve for a hydration pouch (also holds the foam pad in place) and entry/exit hole for the tube. The minimalist and boxy rectangular shape make for a good bit of usable space when it comes to packing gear in with the help of the full length zip. Like I said it does let you access all areas. Round the body of the rucksack there are plenty of attachment points, a couple with reflective tape, should you feel the need to hang things off the 'sack or you can't get everything inside the generous 35 litres. Most likely a helmet, ropes for the climbers or ice axes for the winter walkers. That is one thing it doesn't have, loops for axes. 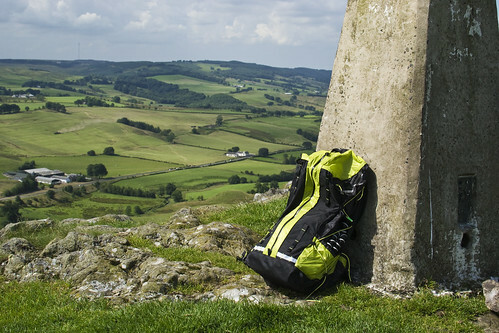 You also have a couple of deepish pockets either side for water bottles or in conjunction with the side compression bungies you can secure walking poles or a camera tripod. There is loads of bungee cord on those side compression pulls. I ended up trimming it down a bit as I felt there was more than enough especially if you are securing gear in a half filled pack. You end up with cord whipping all over the place. Not much worse than the wind catching it an’ skelpping you in the dish with it. On the top of the right hand side there is also a zippered pocket that has a secure clip for your keys, its slightly bigger than the waist strap pockets. The harness has the same comfortable padded mesh as the the back panel and the sternum strap has the standard built in whistle on the buckle. The strap also has some leeway to move it up and down the torso.